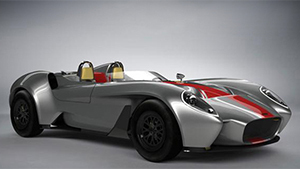 Born from Anthony Jannarelly and Frederic Juillot, who created the Jannarelly project in order to create a car with a retro stfeelyle, but equipped with the most modern components, the first Jannarelly roadcar is called Design-1 Launching Edition, and unlike the name, it's not a concept car. In the movie Fast & Furious 7 there is a special red hypercar, the Lykan, produced by W Motors and designed by a certain Anthony Jannarelly, a project entirely made in the United Arab Emirates. And it is exactly Jannarelly who has presented his new project, the Jannarelly Design-1 Launching Edition.